A software engineer may have to play different kinds of roles within an organization. It is not just all about developing software. They may be employed in software testing department, or they may also be deployed in quality assessment department. The software update is also a sphere where a lot of software engineers are used. Thus, for an organization, it is important to define job roles of the software engineers. For that, seamless and efficient software engineer Job Description Samples has to be written. Software quality testing is an important stage of software development. Engineers who manage quality testing part of software are termed as quality testing engineers. 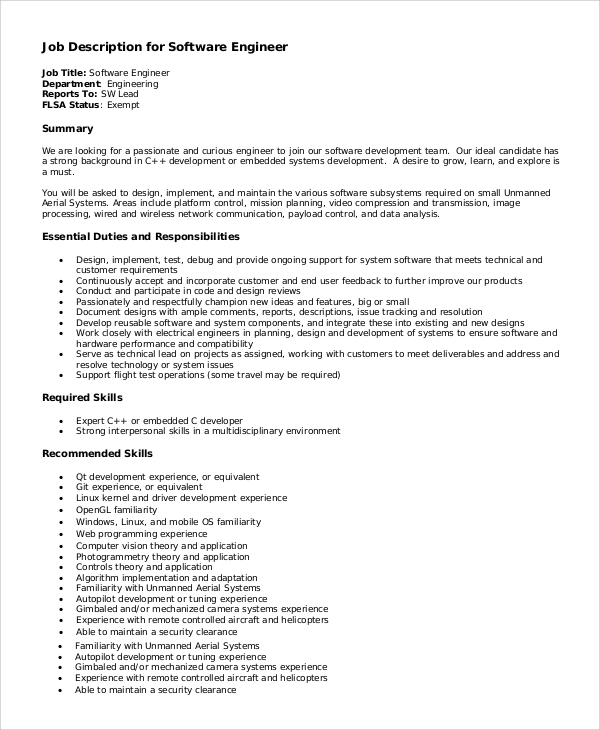 Here is a sample job description for them. A senior software engineer plays a crucial role in software planning or visualization process. His role in the development process is also important. To write the job description for a senior software engineer, downloading this description is suggested. Here you can find a job description for a software engineer. Support and maintenance are important phases of software development and management. For that, you can simply use this sample. A software developer should be focused on his job otherwise, it will dismantle the whole development process. 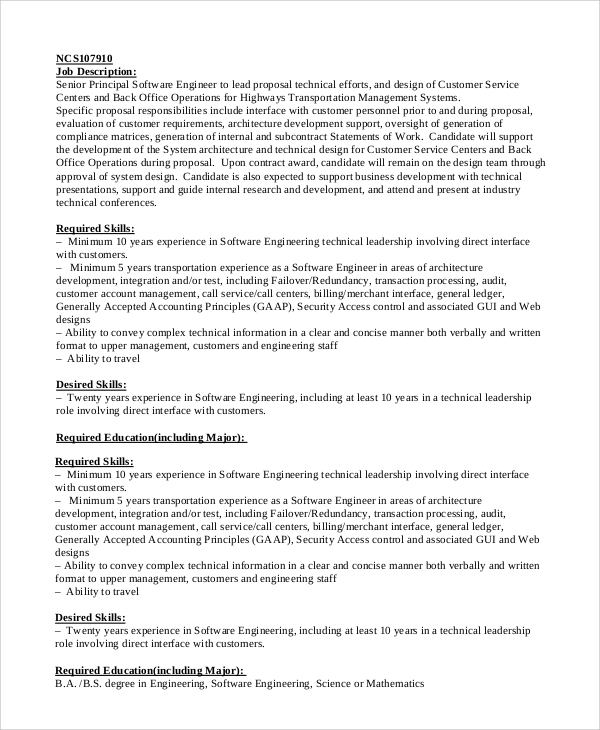 Organizations need to specify job roles of their software engineers with a properly written software engineer job description. Software testing is an important phase of the software development process. Productivity, usability, and performance of software depend on the testing phase. 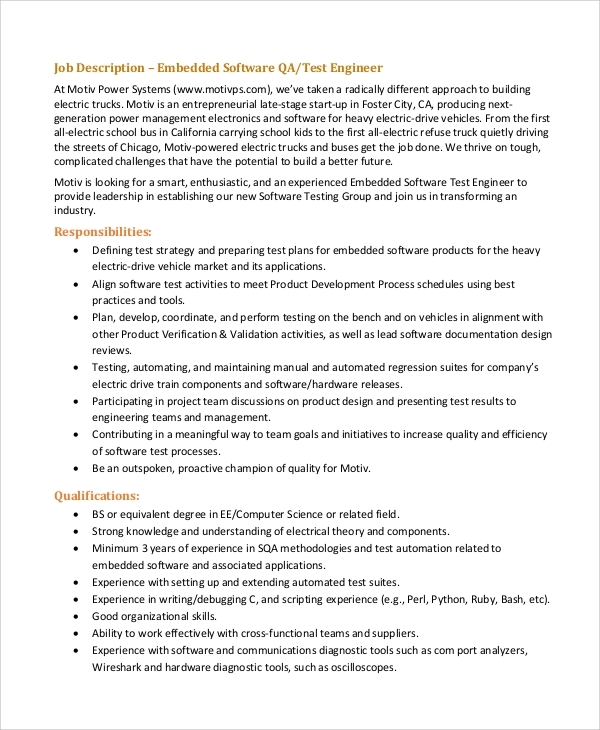 Use this sample job description to define the job role of a software testing engineer in your organization. Software engineering is a field which includes a lot of things. Software engineers have to have knowledge on a lot of things like coding languages, etc. This is why job roles or responsibilities of software engineers vary from one organization to another organization. You can also see the Executive Assistant Job Description Samples. For organizations, it is important to define the responsibilities of their staffs with perfection so that the organization can move in the right direction. When an employee does not know his job roles, his/her performance will not become productive for the organization. This is not the fault of the employees, rather a mistake from the side of the employers. 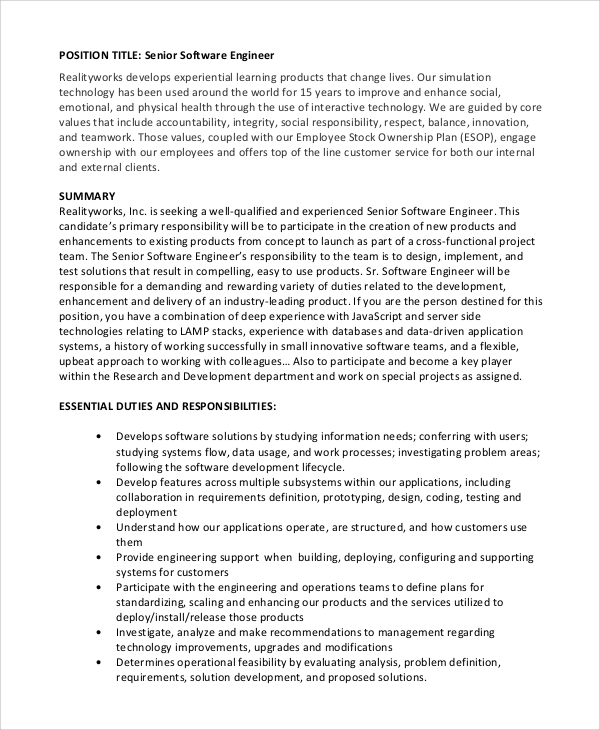 Use the online samples to create job descriptions for software engineers. Who Should Use The Online Software Engineering Job Description Samples? Sample job description can be used for writing a job description for a person or a group of employees. Software engineers have to deal with various kinds of job roles and responsibilities. They may have to work in the software planning department, or they may have to take responsibilities in software development department. 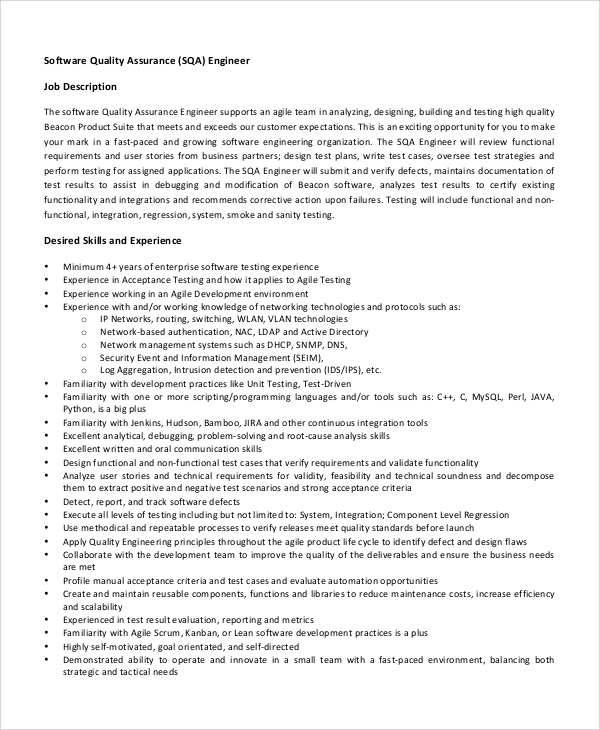 A software engineer may also be deployed in software testing, maintenance, and update department, as per needs or requirements of the organization. This is why the companies need to describe or define job roles and responsibilities of the software engineers. 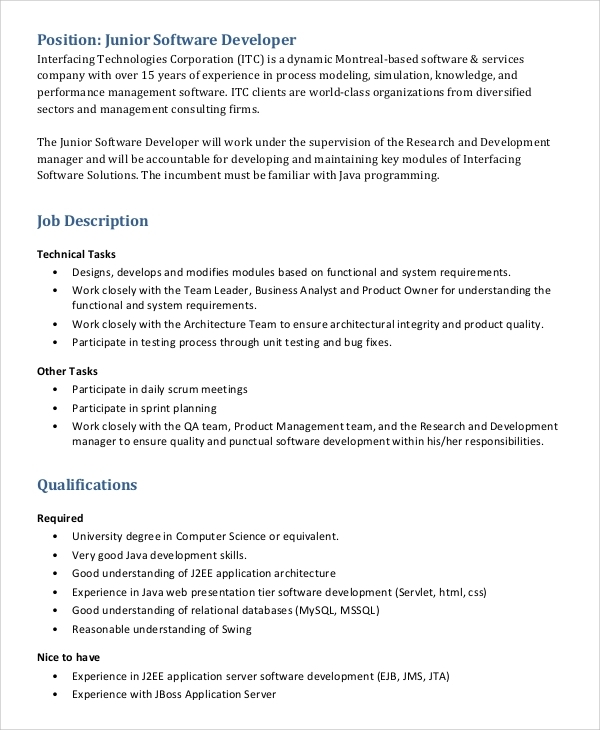 For that reason, you need to download the online sample for software engineer job description. 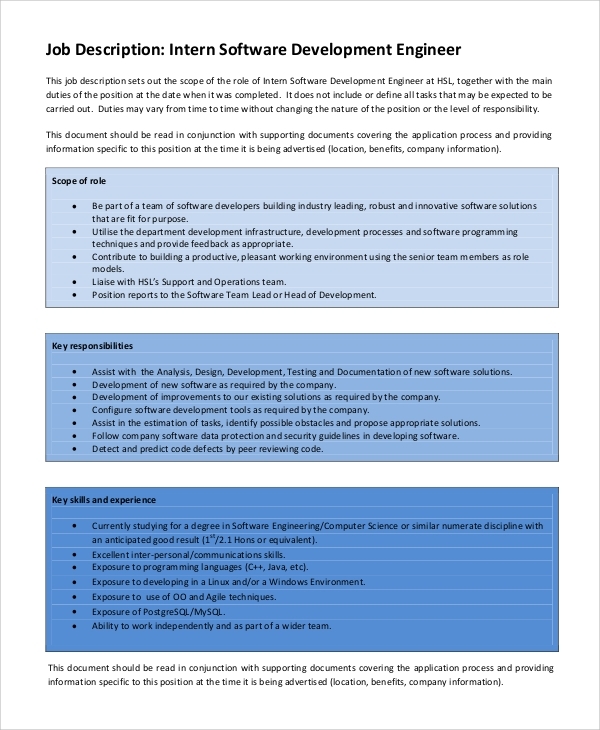 Writing a job description for a software engineer is always a tricky thing, as software engineers Job Description Templates are deployed in various departments. Software has its unique life cycle, and that is why different departments are there to work on the various life cycle of the software development process. 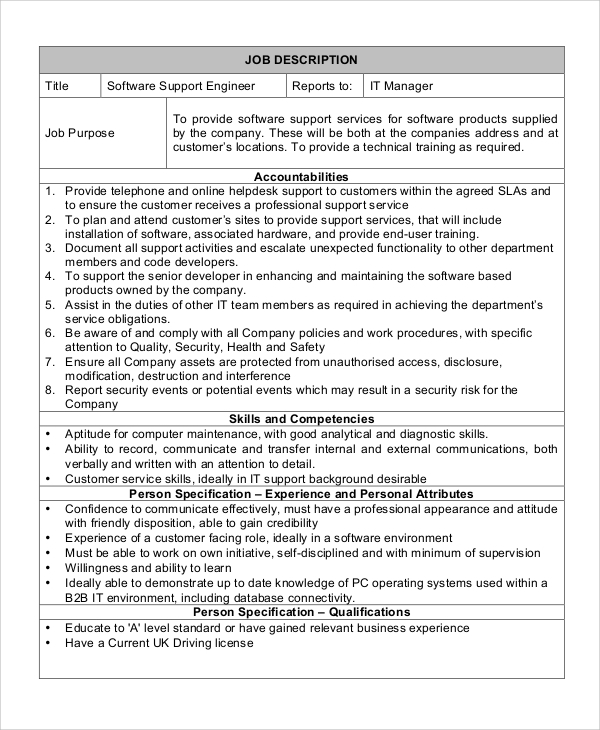 Download the online templates for writing seamless job descriptions.